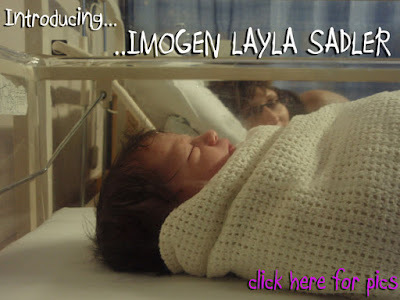 Tim and Vicky Sadler would like to introduce you to their daughter Imogen Layla Sadler. Born after a sprightly 38.5hr labour, little Immy was born at 17:22 on the 3rd of November 2008 at Stepping Hill Hospital in Stockport. Weighing in at 7lbs, she is a healthy bundle of baby. Vicky showed the stamina of an olympic marathon runner and is still showing no signs of fatigue, whilst Tim is living on energy drinks, flapjacks and cups of Earl Grey Tea. Click the above shot for more pics or click here. This is version 7.0 of www.vic-tim.com for 2016.....that is a long time to be running a blog! Tim Sadler (c) 2014 - ALL RIGHTS RESERVED. Simple theme. Powered by Blogger.